We are delighted to announce that ‘Pay Less for the Dress’ was a resounding success and it raised a massive €8578.45!! It wouldn’t have happened without a lot of dedication and time from the amazing, voluntary, organising committee of Michelle, Maylinda, Vivienne, Lynn, Martina and Michael who organised the event on our behalf. Thank you from all of us here at AADI and also thank you, on behalf of the children and families on our waiting list. Also a special thank you to their family and friends who helped out on the night but most importantly supported and encouraged them in the weeks leading up to the big event. On the night, the atmosphere was buzzing helped in particularly by the performance of singer, Linda Keane and the MC Lorraine O'Connell. 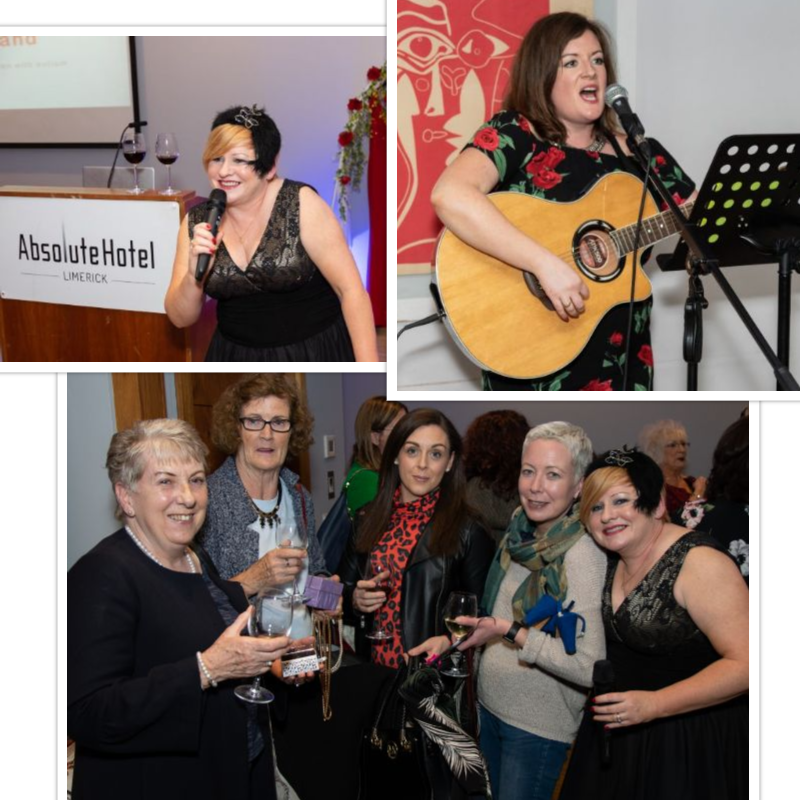 Our special guest on the night, DJ Louise Cantillon from Spin SW added to the excitement and buzz in the Absolute Hotel who kindly facilitated the event by gifting us the use of their Abbey suite. It took an army of 15-20 volunteers to staff the event on the night, many of these volunteers had been with us all day preparing the room for the event. The effort was outstanding but it really payed off. The feedback from those attending was amazing. We were delighted that everyone who attended had such an amazing time. University Concert Hall, Establishment Bar & Restaurant, Spotless Dry cleaners, Aura Leisure Centre, Trabolgan, Matthew Stephens Jewellers, Game of Thrones tours Belfast, Delphi Resort, Glen Tavern, Chapel St Tattoo, Third Eye Tattoo, Soul Addiction Tattoo, Nolans Butchers, The Fit Factory, Gain Pet Food, Loughwell Farm, Savoy Hotel, Visage Hair Salon, TK Max, Currys, Ballyneety Golf Club, Tap House Annacotty, Woodlands House Hotel, Catherine Hickey Hair, Ez Living, Thompsons Funeral Home, Dannies Closet, Mountain Warehouse, Lough Lannagh Holiday Village, Pat Shack, Delta Karting, Lloyds Pharmacy, Tracy Skehan Hair, Deirdre Kelly Beauty, Jeeves Dry Cleaners, Dulla Ploughing Association, Adams of Glin, Maria Byrne, Avril Henry, Hugh Campbell, Cahill’s Cheese, Brown Paper Killaloe, Irish Rail, Lynda Keane, Virginjas Bridal Shop, Dream Ireland Holidays, Carambola, A Class Above, Abbey Boarding Kennels, Ballymorris Pottery, Angel Times, Laura’s Baked Creations, Garrets Butchers, Galway Bay Hotel, Unique Hair & Beauty, Barkers and Bowes Dog Groomers, Limerick Printmakers, Alexandra Dental, Back Baller, ERS, Willie O’Dea, Tesco Roxboro, Amees, The Ivory Closet, So Beautiful, Harper’s Coffee, Be Fabulous, Lawless Flowers, Vanilla Browns, Reva’s Spa, Bean an Ti and Supervalu Castletroy. We have a large number of dresses still remaining after the event and we are excited to hear what fundraising/event ideas our volunteers are going to come up with to sell the remaining dresses. So if you missed the main event, keep an eye on our facebook for details of upcoming events/dress sales!